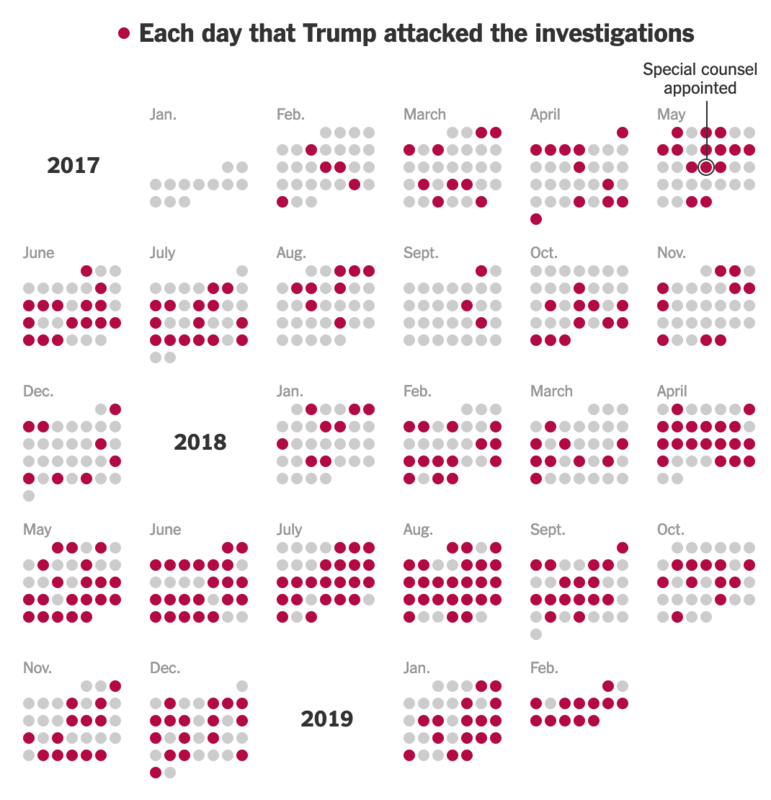 Yesterday the New York Times published a fascinating piece looking at the data on how often President Trump has gone after the Special Counsel’s investigation. (Spoiler: over 1100 times.) It makes use of a number of curvy line charts showing the peaks of mentions of topics and people, e.g. Jeff Sessions. But my favourite element was this timeline. All the dots. So many dots. It’s nothing crazy or fancy, but simple small multiples of a calendar format. The date and the month are not particular important, but rather the frequency of the appearances of the red dots. And often they appear, especially last summer. Credit for the piece goes to Larry Buchanan and Karen Yourish. 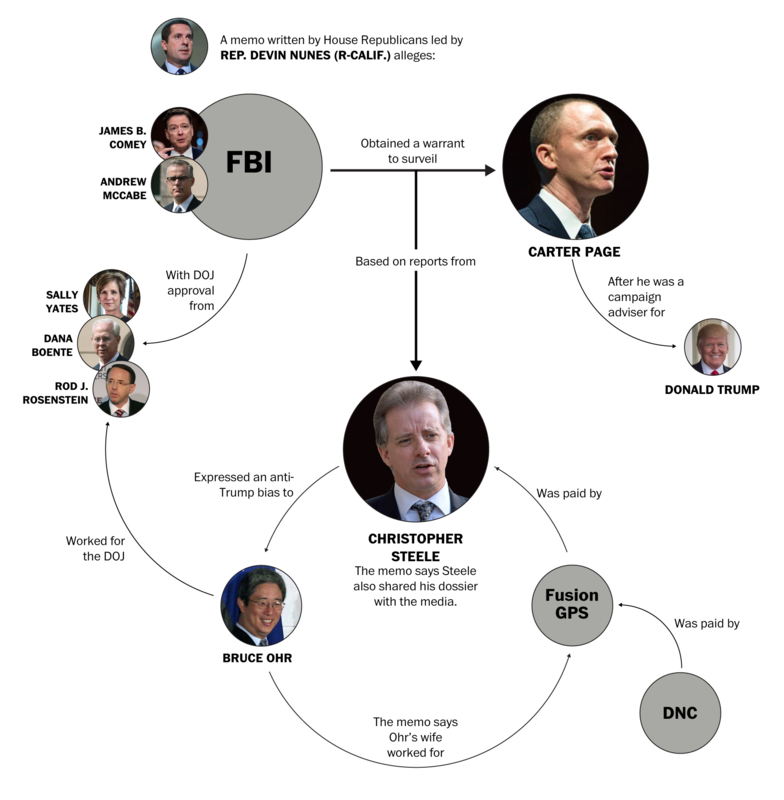 In case you missed it somehow, the President of the United States, the Leader of the Free World, is now also an unnamed, unindicted criminal co-conspirator in a federal campaign election law case in New York to which his co-conspirator pled guilty. And you thought Obama’s tan suit was bad. 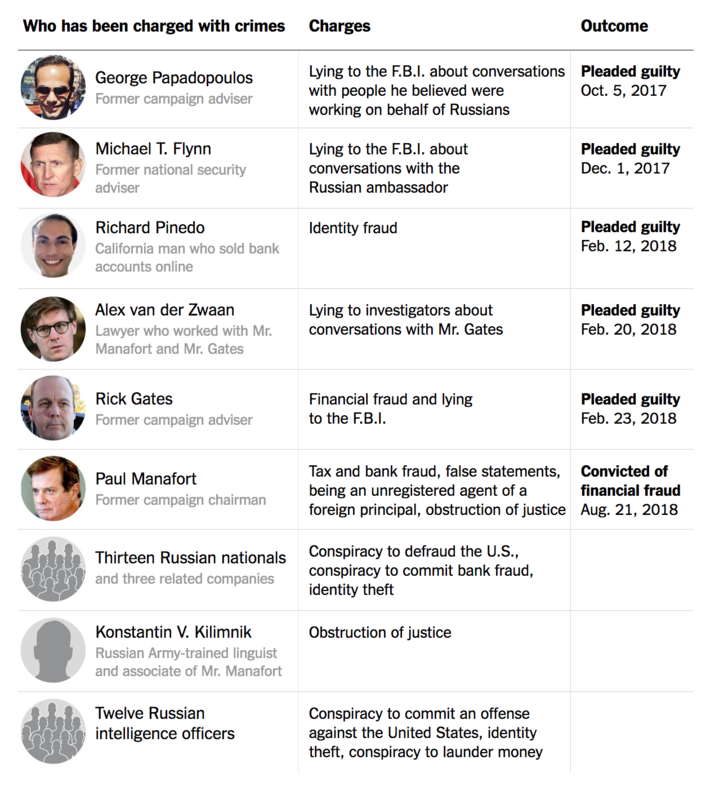 The guilty plea by Michael Cohen and the eight convictions of Paul Manafort are all part of a growing scandal surrounding the White House. 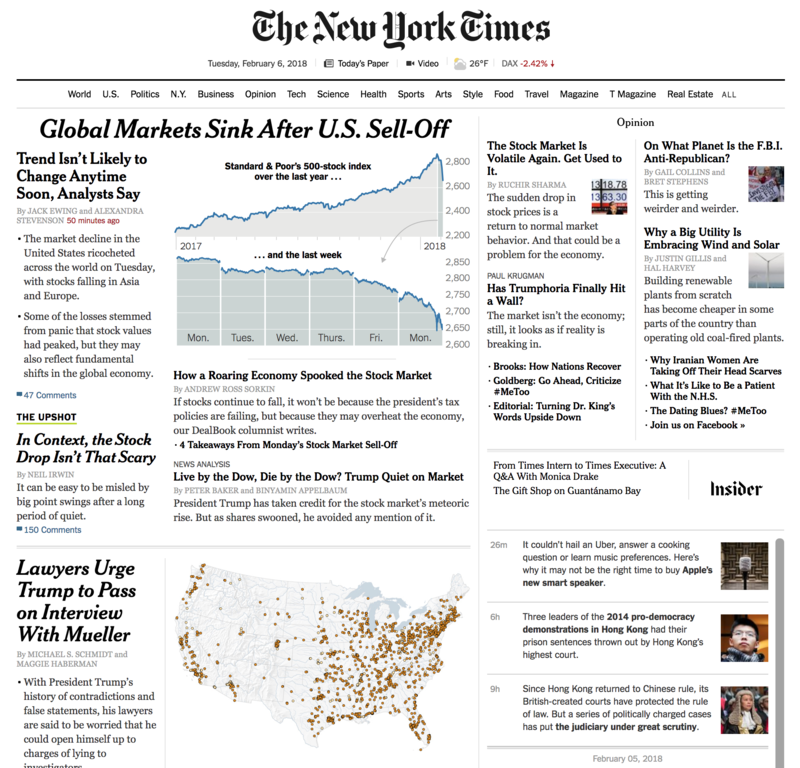 Thankfully the New York Times published a piece highlighting the results of the various trials. In short, the former National Security Advisor has pled guilty, as has a former campaign advisor, a former deputy campaign manager/transition leader/early administration staffer, and another campaign advisor. 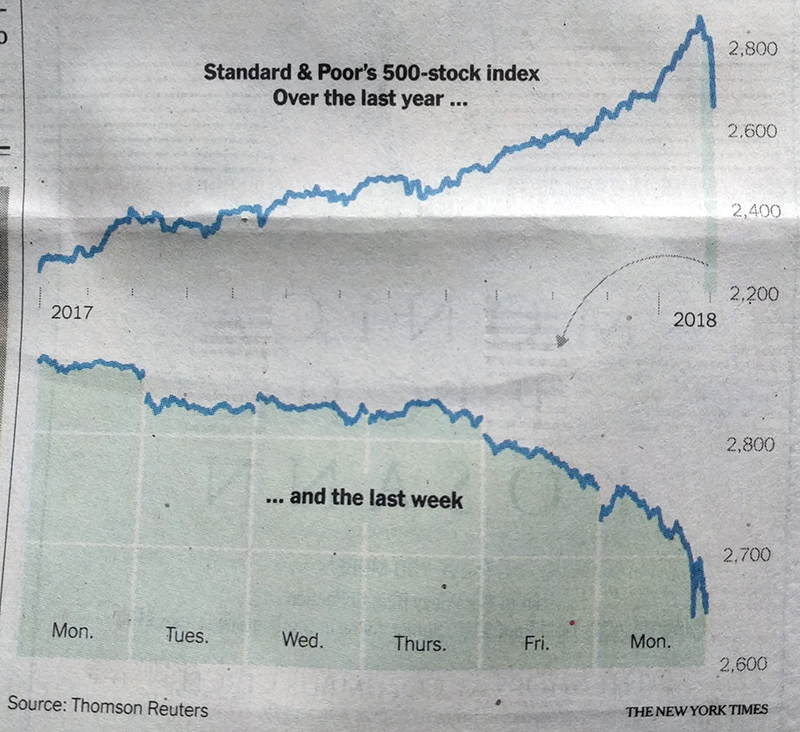 Throw in yesterday’s news and this table will get longer. How much longer will the table get? Yo. C’mon, bro. This jawn is getting tired. Just stop already. 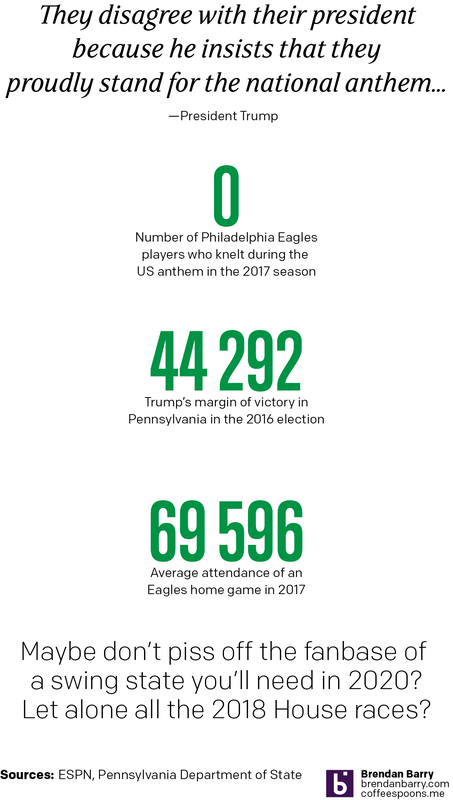 If you did not catch it this week, the most important news was Donald Trump disinviting the Super Bowl champions Eagles to the White House to celebrate their victory over the Patriots. He then lied about Eagles players kneeling during the US anthem—no player did during the 2017 season. He then claimed that the Eagles abandoned their fans. Yeah, good luck convincing the city of that. So naturally we have a Friday graphic for youse. Full disclosure: I root for the Patriots. But I mean, seriously, can’t youse guys do the math? Continuing with election-y stuff, I want to share a fascinating map from the Washington Post. 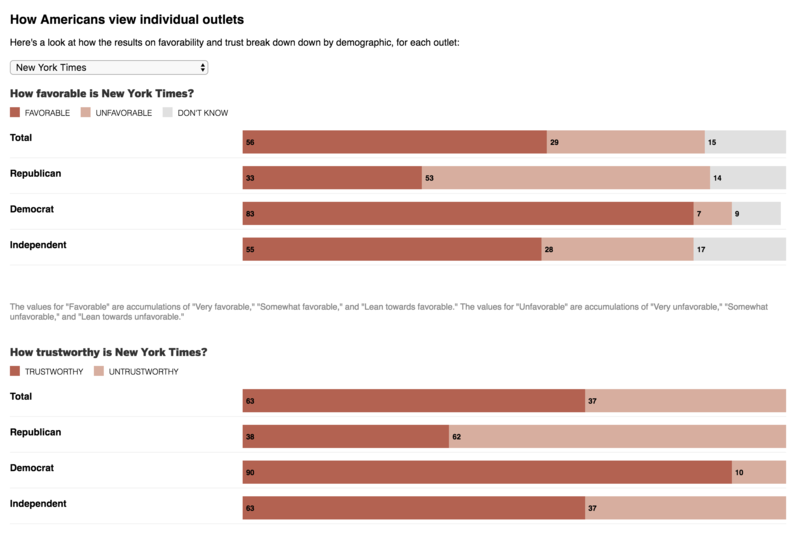 The article came out last week, and it is actually incredibly light in terms of data visualisation. By my count, there were only two maps. 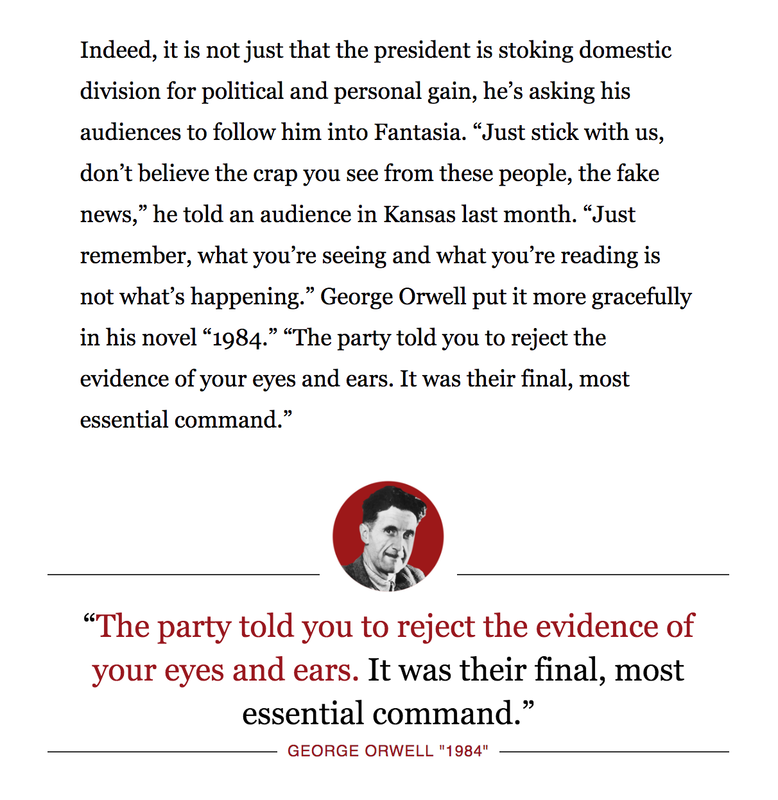 The article’s focus is on interviews with Trump voters in 2016 and how their opinions of the president have changed over the last year or so. If you want to read it, and you should as it is very well written, I will warn you that it is long. But, to the map. What I loved about this map is how it flips the usual narrative a bit on its head. We talk about how much a candidate won a county in 2016, or even how much the vote shifted in 2016. And anecdotally we talk about “ancestral Democrats” flipping to Trump. But this map actually tries to chart that. 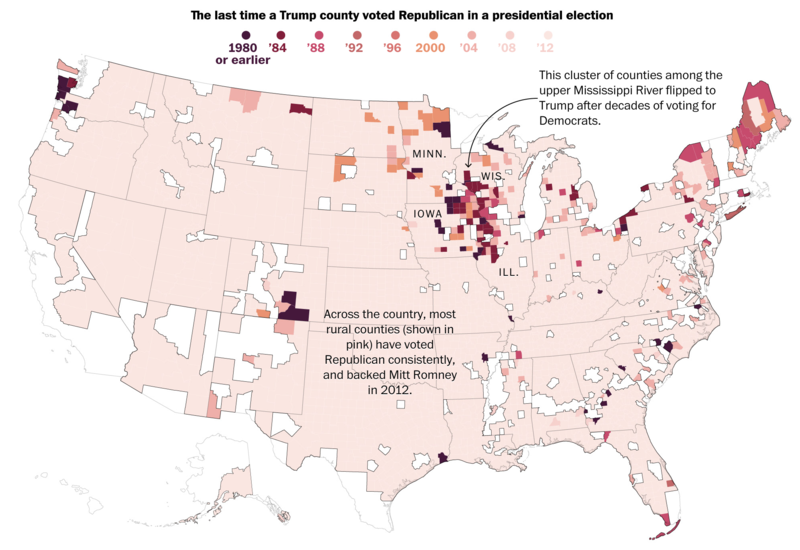 It reveals the last time a county actually voted for a Republican presidential candidate—the darker the red, the further back in time one has to go. Counties that vote Democratic are white, because why do we need them for this examination. Omitting them was a great design decision. Much of the country, as we know or can intuit, voted Republican in 2012 for Mitt Romney. But what about before then? You can see how the upper Midwest, along the Mississippi River, was a stronghold for Democrats with some counties going as far back as the 1980s or earlier. And then in 2016 they all flipped and that flipping was most significant there—of some additional interest to me are the counties in Maine, the Pacific Northwest, and along Lake Erie near Cleveland. In short, this was just a brilliantly done map. And it sets the tone for the rest of the article, which is interviews with residents of those counties called out on the map. Credit for the piece goes to Andrew Braford, Jake Crump, Jason Bernert and Matthew Callahan. 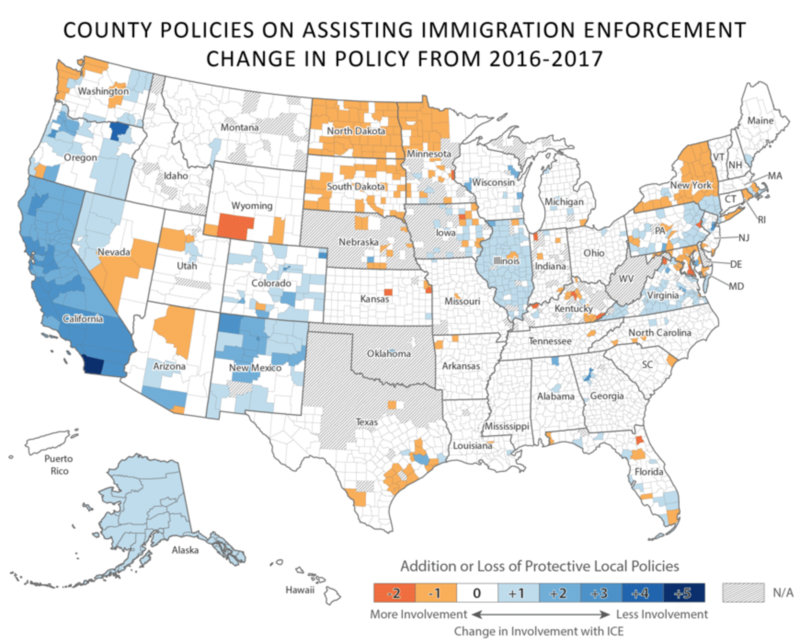 Almost two weeks ago I read a piece in City Lab that used three maps to look at the changes to immigration enforcement in the first year of the Trump administration. I was taken by this final map in particular. While the map does have some large areas of N/A, it still does show some interesting geographic patterns. I think New York showcases it the best. Counties that are less involved in enforcement operations are in the southern part, near New York City. But then you can begin to get a clear sense of what is “upstate” by that break roughly parallel to both the Connecticut and Pennsylvania northern borders. To a lesser extent you can see the same pattern play out in Pennsylvania. While far more white—as in no change on the map—the counties of orange—more involvement—are located in the interior and western counties. That is perhaps somewhat in the same space as Pennsyltucky. Immigration is clearly an engaging topic these days, and I found this map interesting not because of its design, but because of the geographic stories it tells. Credit for the piece goes to Victoria Beckley. So last week the House of Representatives published a highly controversial memo by Representative Devin Nunes. Why controversial? Because it is apparently missing dozens of pages of additional facts, data, and context. 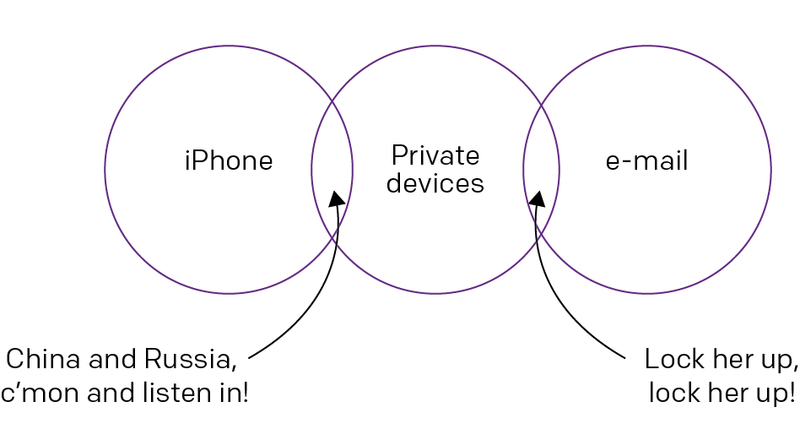 But what the memo does contain are connections between people and things. 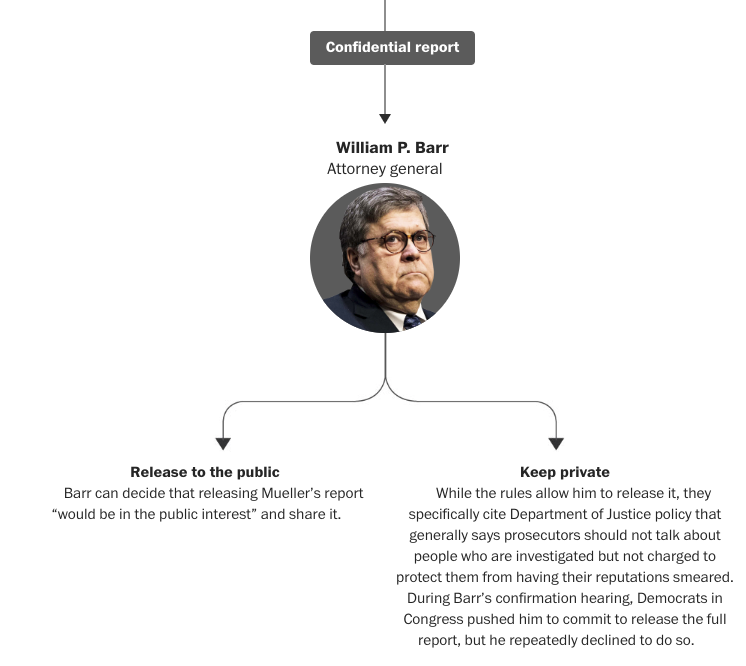 And this Friday piece from the Washington Post does a good job of trying to explain those connections. 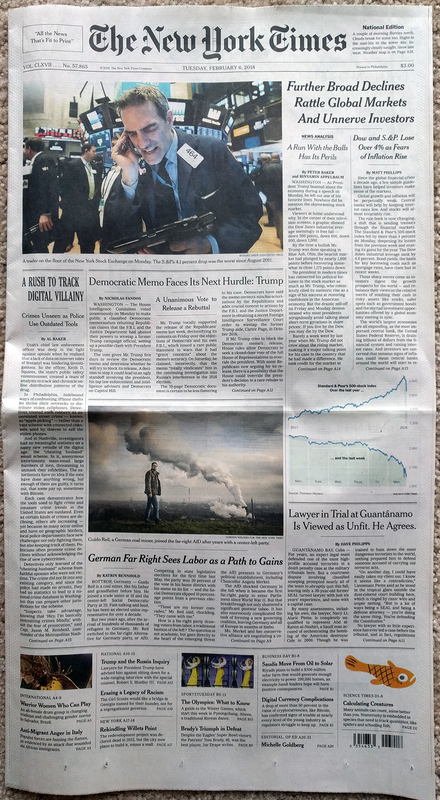 Credit for the piece goes to Darla Cameron, Julie Vitkovskaya, Reuben Fischer-Baum, Ann Gerhart, and Kevin Uhrmacher.